The George Zimmerman murder/manslaughter trial is almost over. After a month of No Charges, a 6 month delay with indicting Zimmerman for the Trayvon Martin shooting (after a public media campaign spearheaded by Rev Al Sharpton et als), and a very public attention to the court trial, we will/may soon have a verdict. The question begs: "Why do we even care about a young Black teen's shooting?" My answer: 'It didn't have to happen. Why was it necessary for a human being to be shot with a firearm simply for being in the wrong place at the wrong time? I've reported and written commentary about the Martin/Zimmerman issue twice (this is my third blogpost). Although Black Youth are gunned down everyday within these United States, it shouldn't make any of us any less aware nor desensitized. A human being was killed..needlessly. 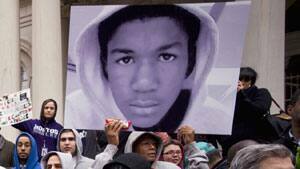 Trayvon Martin represents a dark mark on our North American culture. That is that race relations and equality has a LLLLOOOOOOONNNNNNG Way2Go! It will be a travesty of justice to send a message that another human being can be lawfully gunned down in the absence of a crime being committed. So Very Sad -- so very sad. Appreciate your post, but was Trayvon "in the wrong place at the wrong time"? Wasn't he where he was supposed to be at the right time? Wasn't he temporarily staying in the apartment complex? Wasn't it Zimmerman who was in the wrong place with mal-intentions? There are many racial tragedies. Many years ago, a child that I loved very much was savagely murdered in Orlando. She was white and only 17. Her murder made all the local headlines for several days and the police relentlessly pursued her killer until he was finally caught three years later. They never gave up. That's sad enough, but this is the real travesty. In the Orlando papers the day after she was killed (hers was front page)there were two black male youths also killed and only received a few short sentences in the obit column. I have never heard that the police pursued those cases or not, and they certainly got no press coverage. That poor girl was dear to my heart, but those boys were also dear to someone else's hearts. They deserved better.